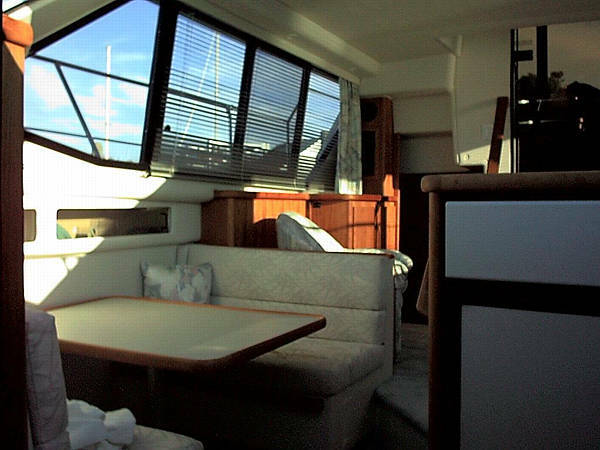 I used to live on a boat (pictures of the boat below) in a Redwood City, California marina named "Peninsula Marina". I moved aboard on 5/23/2000. 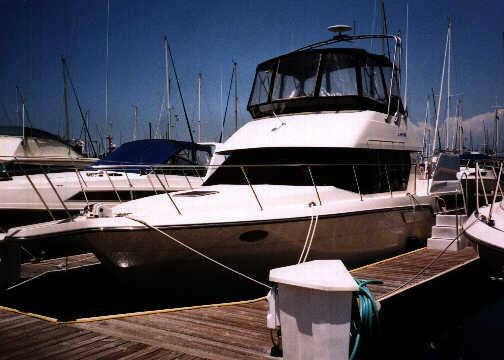 However, as of 1/21/02, I moved ashore and sold the boat. It was a sad day. The reason I stopped living on the boat was that a developer decided to fill in my marina with dirt and build 1,300 condos. You can read a little more about it here. Click here for pictures of the last cruise I ever took with some friends on my boat. Click on the following for pictures from various other cruises: BlueAngels, and Random Day. 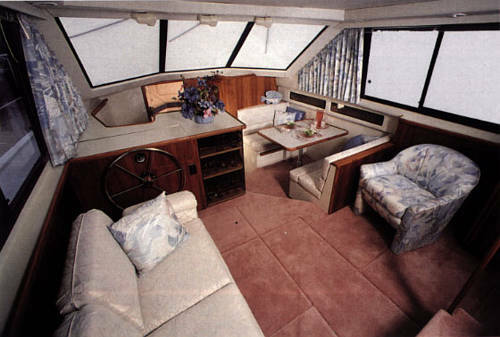 The boat was a 1991 Carver 35' Aft Cabin powerboat (not a sailboat). Living aboard was just something fun and silly to do for a year or so. It turns out to be about the same cost as living in a one bedroom apartment in Silicon Valley because of the extremely high cost of living here. The boat's name is "Kirsten Renee", named after the oldest daughter of the previous owner. - Going north on 101, take Whipple Ave exit. - Take three quick right turns as fast as possible. Now you are traveling south, with 101 only 10 yards off to your right. - Go 40 yards and take the first right into "Peninsula Marina"
- Park, find the boats, call me on my cell and I'll let you in through the locked gate. 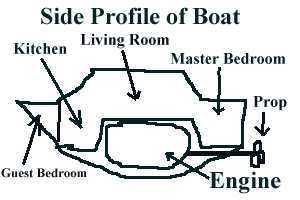 This is NOT my boat, but same model and a rear view. Mine does not have the hard top over the back shown. 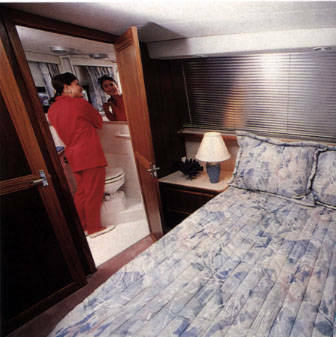 But the square window on the back is a window into the master bedroom. Standing even farther forward in my boat, looking backwards. The white square on the right is the refrigerator in the galley. 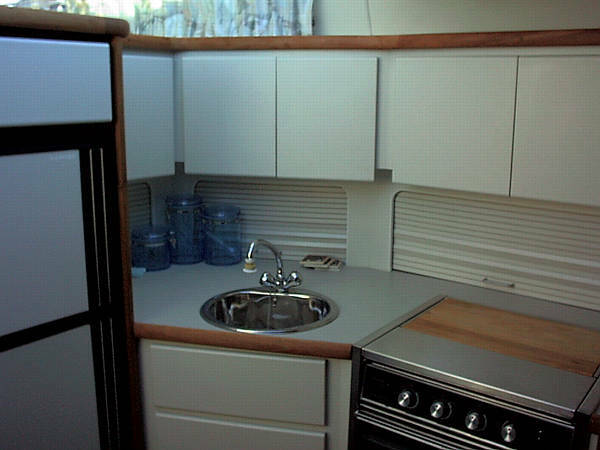 This is the galley, the white square on the left is the refrigerator (see the above picture also). The stove uncovers to a 3 burner stove top, and below it is an oven. The head room in the kitchen is about 9' tall, so standing up straight is no issue. 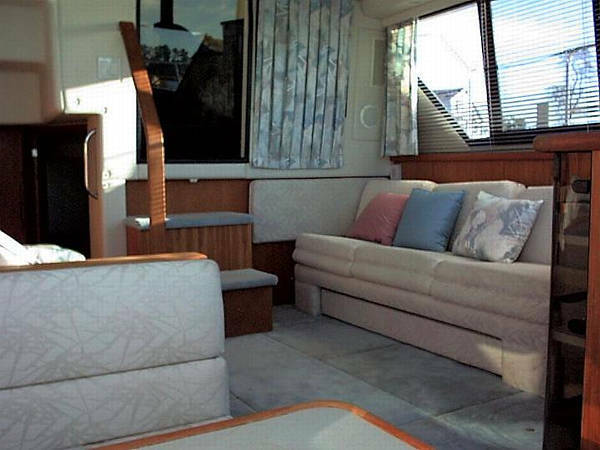 This is the master bedroom (in the back of the boat), looking into the master bath. The headroom in the master bedroom and master bath are about 6'3", so with shoes on I have to duck my head slightly all the time in this room. Closer picture of master bathroom. 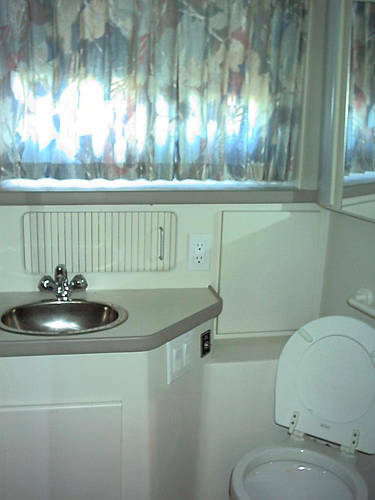 The shower is to the left. 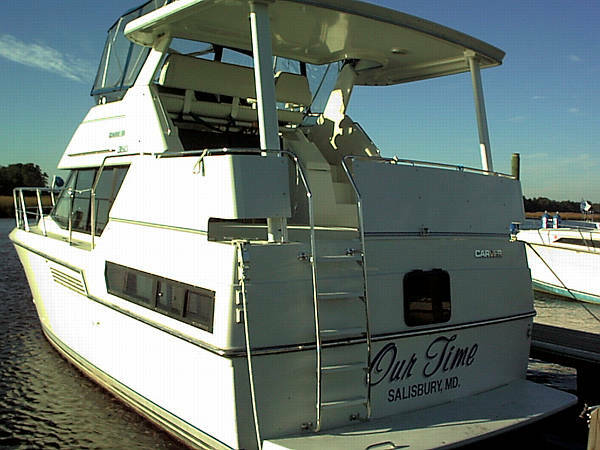 Some more pictures of my boat (the day it was sold) are found here. Return to Brian's Random Stuff page.